Accent long windows by installing a set of colored window panels. These modern panels feature one color on the top portion and a contrasting color on the bottom. Dimensions 11.0 In. X 8.0 In. X 3.0 In. They are not black out. The gray is gun metal colored and the white is nice and bright. A bit too dark for me personally, BUT they are a nice curtains. 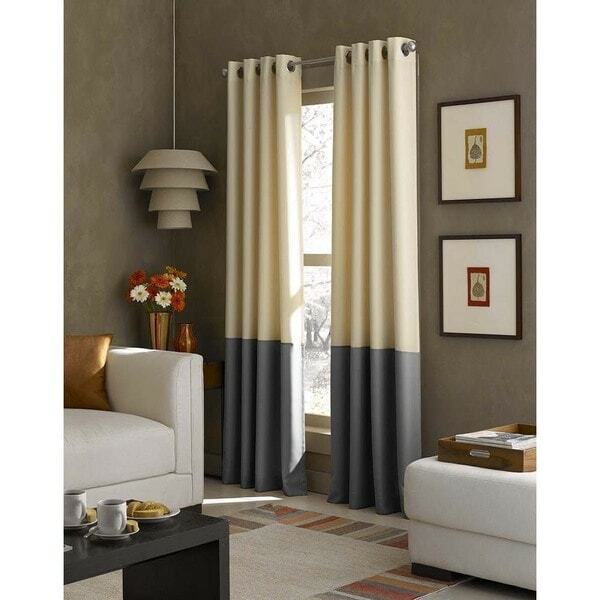 The curtains aren't totally sheer, but they do block out light and look expensive. 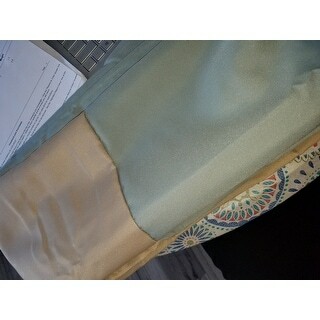 The quality of this fabric is poor and the color on the screen does not match the color of the product,. The ivory/grey color is more yellow than it appears. I retirned these and would not recommend them. Color is not as pictured at all. I am truly disappointed in Overstock. I selected blue but received peacock. Not a stitch of blue on these curtains, so why are they called blue? 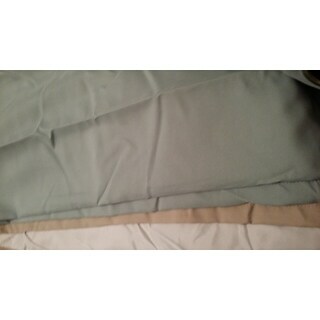 I received curtains that are mint green and tan. Then I'm told it will cost *** to return them. Overstock has the wrong color description, but I'm supposed to pay for their mistake. The customer service rep seemed to not care much about the discrepancy. This makes me not want to order from Overstock ever again. I was very disappointed to see the color of my Kendal Color Block curtains. I assumed from the write up, picture and options that these were light khaki on the top with blue on the bottom for . 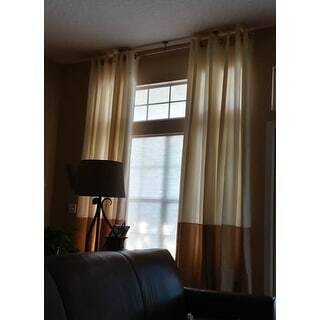 This same picture came on the curtain package but they are dark khak curtains Be aware that the web page may not match what you receive and you will be responsible to pay *** for shipping if you want a refund no matter whose fault it was. the bottom color is perfect, it is actually like the picture. The top color is a yellow color not like the picture at all. I ordered blue but arrived in different color. Not even a single lining of Blue. As much as i want to return it sadly i need to pay *** for shipping. Will never buy again. Weight is perfect, the peacock color is hideous. I would prefer blue. I really should have checked the return policy on these. I was concerned about quality before I ordered them. I felt better after reading the reviews. Since I knew this might be an item I would return. I should have checked the return policy. Overall, this was a very low quality material. I read the reviews and felt good about it but I should have stuck with my initial feeling that a $* curtain panel would not be a good quality. I was very disappointed. Very cheaply made. I would have kept the curtains, but the butter color was way too yellow. Nice color, good material and weight. This curtain is attractive. It has a good solid weight. But it's not a blackout curtain so light can still show through. I was EXTREMELY disappointed when.... to my surprise a substitute curtain arrived two weeks late!!! This was an absolute first for me! I was unable to return them or complain because they were for my husbands game room and he wS home to receive them. He opened them (they were a surprise) called me excited to say he loved the and already hung them. You can only imagine my face when I came home and saw the complete wrong curtains hanging in the room! Bad job this time! Thank god the match!! Beautiful panels! Ordered the white and grey bottom and I love them! Great addition to the modern farmhouse look! High quality at a great price. Look of elegance. Took down while painting, I will post a picture when they are back up. I bought these in the color ivory and they look exactly like in the picture. They are not blackout but also not see through so exactly what I was looking for. The curtains are very well made and were a perfect match for us (Ivory). I decided to ceiling mount them (they are the 120" length) with a rod from Overstock. I am so happy, they filter the light but aren't room darkening which is what I wanted. They finish off the room perfectly! 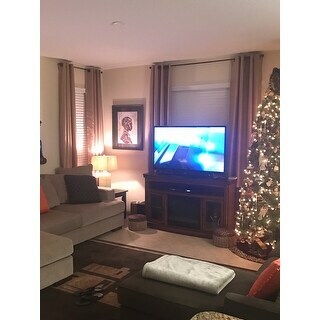 Love the curtains I purchased them for my guest bedroom and they look great! great quality, lined, not shiny. Really don't to bvb find 10 ft long curtains that are not shiny. I love these!! I thought it came in pairs and its thin. Great purchase i have made for my Grandmother house she loves the curtains. "What color is the bottom of cream? What color is the bottom of ivory?" The cream has a black bottom and the ivory has a taupe bottom. "What color of yellow is the yellow drapes? It looks like a pale yellow. And what color is the top color on the yellow drapes...a white?" It is a cream or khaki color. "What diameter rod does everyone use for these? " The grommets are 1.5", so any rod 1.5" or less. "What color is at the bottom of the Black drapery panel?" "I feel colorblind. I have 4 108 panels in my cart but WHAT IS THE BOTTOM COLOR on the butter panels? Help. TIA"
It's a dark gray and the butter part is more of a creamy yellow color. Both colors are darker than they appear in this picture, but they are still beautiful curtains. "Are they blackout curtains?? What is backing???" No, they are room darkening, but no completely black out. "WHAT COLOR IS THE BOTTOM PORTION OF THE WHITE CURTAIN"
it's dark grey. It's a cool grey so it's more of a blue grey.